David Ramsey's hospitals and emergency departments in West Virginia see the effects of the opioid epidemic every day. Medicaid beneficiaries battling addiction and psychiatric disorders crowd into his emergency departments even though the CMS has launched a nationwide policy to pay for substance-abuse treatment and stays at inpatient psychiatric facilities. But a year after that Medicaid policy became effective nationwide, Ramsey's hospitals have seen no relief. Each week, Ramsey's Charleston Area Medical Center has to ask a local court to conduct mental hygiene hearings that Medicaid patients need in order for the state to approve their transfer to a free-standing psychiatric hospital that can provide them better care for their severe mental health or substance abuse issues. In the meantime, those patients are spending hours or days in his emergency departments, unable to get the level of care they need. Unlike general acute-care hospitals, free-standing psychiatric facilities have staff that specialize in a gamut of mental illnesses. "It's pretty silly really. The need is sort of off the charts, especially with the opioid epidemic," said Ramsey, CEO of the Charleston Area Medical Center. "We see the need in our ER every day and to not have access to an available resource is pretty sad." Hospitals across the country are experiencing similar pains as states slowly work to lift the decades-old ban against reimbursement for institutions of mental disease, or IMDs. Since Medicaid's creation 50 years ago, the program has refused to pay for treatment at IMDs, which include most residential treatment facilities for mental health and substance use disorders with more than 16 beds. Last year, the CMS finalized a policy allowing Medicaid managed-care plans to pay IMDs for short-term stays lasting 15 or fewer days in a month. The CMS estimates that 7.1% of adults ages 21 to 64 meet the criteria for serious mental illness that requires at least some inpatient treatment and that 13.8% experience serious substance abuse disorders. The rate of need, as well as years of state requests, led the agency to grant the new permission. As of August, only seven of the 39 states with managed-care Medicaid programs have started paying IMDs for those stays, according to email responses to a Modern Healthcare inquiry from state Medicaid agencies. Those states are Florida, Indiana, Michigan, Ohio, Rhode Island, Tennessee and Wisconsin. States that haven't started paying for Medicaid beneficiaries' IMD stays say they are still trying to figure out how to develop rates for the facilities or have pending waivers with the CMS to pay for more than 15 days of care. West Virginia officials also said they were concerned about a provision in the managed-care rule that asked them to take back any reimbursement paid out by a managed-care plan for treatment that surpassed the 15-day limit. "There are serious operational challenges to implement this recoupment provision, which requires the ability to track individual IMD stays and set up processes for recouping back-rate payments from plans retrospectively," said Allison Adler, a spokeswoman with West Virgina's Department of Health. The state now has a waiver pending with the CMS to pay for up to 30 days of treatment. Other managed-care states such as California and Maryland say their plans are not paying for the services because behavioral health is carved out of managed-care contracts, and they are only offered on a fee-for-service basis. The CMS rule only lifted the IMD ban for managed-care cases. It would take legislation to lift the ban for Medicaid beneficiaries not in managed care. The IMD exclusion has meant Medicaid beneficiaries suffering from mental illness experience tumultuous care, according to Mark Covall, president of the National Association of Psychiatric Health Systems. 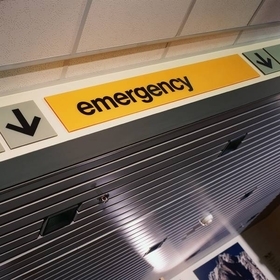 Patients endure long stays in emergency departments and are transferred around from one general acute-care hospital to another, sometimes far from their homes, because of bed shortages. If no beds are available at an acute-care hospital, patients are referred to a state-run, stand-alone psychiatric facility. Under the Emergency Medical Treatment and Labor Act, those facilities can't deny patients admission, even though they won't be paid for their services because of the IMD exclusion. Instead, they often discharge patients early, and those patients receive lower quality care, providers say. Dr. Patrick Runnels, program director of public and community psychiatry at University Hospitals of Cleveland, said even though Ohio now pays for care at psychiatric facilities, he has seen little benefit to his health system. The Cleveland area already had a psychiatric bed shortage, and for-profit facilities in the area that may have bed openings aren't interested in Medicaid patients. "Their business models are predicated on admitting people who who have payers that pay more for psychiatric treatment and Medicaid pays the least, so it's a lost race," Runnels said. Some private psychiatric facilities welcome Medicaid patients, according to Jim Shaheen, founder and president of Strategic Behavioral Health, which owns and operates a chain of 10 facilities around the country. He has expanded the number of beds at some of his locations and is now constructing two new facilities in Iowa and Tennessee, partially in response to the new Medicaid policy. "This has impacted our ability to build more hospitals because this population is now available to us," Shaheen said. "There was a whole subset of the behavioral health population that was not able to access care." Shaheen acknowledges that Medicaid is a low payer, covering as little as 45% to 50% of cost, but he still wants to be a resource for this population. Even if states take a while to pay for IMD services for adults, he feels confident that he'll get enough patients from other payers until additional Medicaid enrollees are able to get care at his facilities. Others say the lethargic rollout has nothing to do with the states, and everything to do with managed-care plans not wanting to spend the money on substance abuse and inpatient psychiatric treatment. An average inpatient weekly stay at an inpatient behavioral health facility can range from $4,000 to $6,000 or even more, according to national health data. The National Association of State Mental Health Program Directors said that managed-care organizations have complained to the CMS that they feel it's too difficult to implement the new policy, according to Stuart Gordon, the association's director of policy and healthcare reform. "They are choosing not to offer the services under their contracts with the states," Gordon said. "The rule does not require them to do so, only authorizes the states to contract for the services." A CMS spokesman did not return a request for comment. Alexander Shekhdar, vice president of federal and state policy at Medicaid Health Plans of America, said that managed-care plans are not blocking the IMD policy rollout and implementation decisions rest with the states. In West Virginia, a resident dies roughly every 10 hours due to opioid addiction. The Charleston Area Medical Center's Ramsey says he's hopeful the state will soon start paying Medicaid beneficiaries' treatment. "This should all be moving forward as fast as possible," he said.